Nice! I really love this program it is way more helpful and useful than I thought it was going to be. As you have webm support in VClip, would it be possible to add that to GifCam aswell? Or maybe have some simple edit tools in VClip as there are in GifCam? I think it will be more convenient to add edit tool to VClip than bringing Webm to GifCam , I will work on that and thanks for using GifCam and VClip. Many thanks for “Save Settings On GifCam Path” option- for me true portable mode is essential! 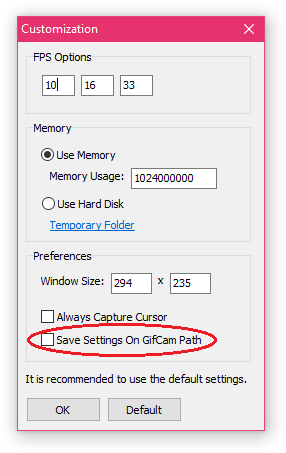 With saving settings option GifCam is more portable than before, thanks smaragdus. If we use “Disk” as memory we can’t edit the GIF ? Because the frames have to be in the memory to be edited, but for now you can edit and delete the recorded frames form the temp folder (%UserProfile%\AppData\Local\Temp\GifCamTemporaryFrames), also version 5.5 can allocate 4 GB which is the maximum memory alcoation for 32 bit applications, so if you have enough memory go and set the memory usage to 4000000000. Can you add the possibility to import / merge 2 gifs in one (and place it to the place of our choice)? Maybe in the next version decembre ! saving settings can include the greenscrean of our choice (no greenscrean for me) ? 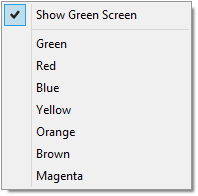 I think no reason for saving greenscreen color choice, as it will be detected automatically. I think he’s asking if there is a way to set in gifcam.ini Show Green screen to off by default, not to a default specific color. At least that’s what I was searching when I found this thread. #BELIEVE there will be some improvements to filename. I mentioned this, year before, but 5.0 versions comments now are just pile of spam. What I think will be nice – some additional checkbox in settings, something like “Filename-to-datetime”. As result we would get automated filenames, so we don’t need to rename GIF.gif each time, if you are creating multiple files in a short period of time. Better late than never! Your GifCam update will make all GIF users rejoice. Developing/sharing GIFs without sacrificing social media security is clutch. Apology of course accepted. Glad to have you back! The best application for creating gifs! Is it only possible that an application contains an option to optimize gif? Once again, the best application! You mean optimizing gif colors and size? currently there are 6 colors reduction options plus custom color reduction and you can edit the gif hue and saturation which can optimize the color and size of the gif and you can analyze the output gif using “profile” functionality. Hmm, still captures the wrong area of the screen with Display scaling in Windows set to 125% (using a 15 inch 1080p laptop monitor at normal scale puts too much strain on my eyes). I hope you figure out that bug for GifCam and VClip eventually. Thank you for the new greenscreen detection, it is a lot more intuitive. Thank you Adam for reporting that bug, I updated GifCam with a screen scaling fix, I think I fixed it permanently this time :) redownload it please. Thank you. The fix worked great. P.S. Just before noticing this I also tried the “Override high DPI scaling behavior” option in Properties > Compatibility and it resolved the issue for both GifCam and Vclip. Nevertheless this is a big improvement and I really appreciate it. Gifcam is one of my most used applications. Love the previous version, and super glad to know there is a big update! First of all, thank you very much for this wonderful little tool! And glad to hear about the new update, I’ve been using it for a while now. One question I have though is how can I capture a “context menu”. Basically the file menu or a right click menu, in my gif? I find myself needing this all the time! Thanks Mark, you can capture context menus like you capture anything else, just right click inside the recording area and the context menu will get captured. Thanks for still supporting this. It is much appreciated. Btw. is there an option to export individual or all frames? That would be awesome, because often enoough I need to edit the .gifs that I create and nothing would be better than exporting the frames from its original source. Tick “use hard disk” option in the customization window to save the recorded frames in a Temporary folder, there is a text link “Temporary folder” in the customization window that leads to the saved frames. The only thing this is missing is the ability to select and delete frames within a gif as a whole rather than one by one. You can delete in-between frames, go to Edit and right click on any frame then keyboard input, there is a delete from to option. Any chance we will have it on Windows Store? Maybe, having GifCam in Windows store gives many advantages like safe install and automatic update, but it seems like Microsoft trying to build a closed platform and controlling software distribution. Thanks for keeping up with the program. The work you’re doing here helps a lot of people. First of all many thanks for such a great little tool! Long story short, it seems GifCam uses BitBlt without CAPTUREBLT (0x40000000) flag, which unfortunately makes all semi-transparent (aka layered) windows to be NOT included in the capture on recent Windows. Can you please either add CAPTUREBLT as an option or simply default (is there any benefit of not including it? ), so GifCam captures screen “as seen” by user? Thanks for the informative comment and sorry for my late reply, I hadn’t noticed BitBlt CAPTUREBLT flag, BitBlt captures layered and semi-transparent windows without CAPTUREBLT Flag at least for any Windows OS with Aero enabled or Windows 8 and above. it’s not well documented I guess it doesn’t have any effect anymore, but I will add CAPTUREBLT flag in any case in the next update. 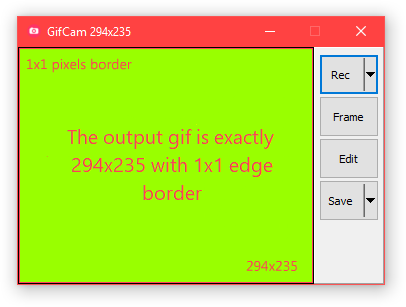 I think at some point I will open source gifcam as a gift, but for now there are other popular open-source gif screen recorders on GitHub LICEcap written in C++ and ScreenToGif written in C#. hi , can i change manu and add something like timer ? Which temporary files? GifCam doesn’t generate temporary files, it save the recorded frames in the memory(RAM). 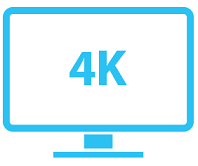 GifCam saves recorded frames in a temporarily folder only if you check use hard disk radio button, it is recommended to use memory option as it’s faster for storing and manipulating data, for long records and if you have enough RAM you can set the memory usage up to 4000000000 (4GB). but if you want to use the hard disk option GifCam saves the recoded frames in the default windows temporary folder %temp%, so change windows default temporarily folder and all your applications temporary files directory will be changed. Should it be 4096000000? The text field is missing binary size units (KB, MB, GB, etc. ), so I can’t tell if it’s using KiB (Kibibyte) or KB (Kilobyte). GifCam Memory usage is in Bytes unit, maximum is 4 GB 4000000000 (4096000000 in binary definition) because GifCam is 32 bit app. If at some point in the future, you feel you would like to discontinue Gifcam, will you eventually release the source code licensed under GPL? Hi Isa, can you make it so the avi export uses the frame timings? It’s a great feature for getting truecolor animations out of the capture in addition to gifs, but the export doesn’t keep the timings so the AVI isn’t very useful if the frames have been diffed and have different timings. Thanks, and I love gifcam and I happily paid for it! Also, you have a tiny bug in that if you often get .avi.avi in the filename…I think the windows file dialog appends it and then you append the extension again in your code maybe? Exactly, I will remove the extra avi extension from the code in the next update, thank you for the comment and the donation, I really appreciate your innovative work in games and software field. Anyway we can increase the maximum amount of frames in a gif instead of just 355? 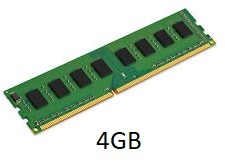 Yes, If your system has enough memory you can expand memory usage to 4 GB, from the Rec button menu select customization in the memory usage type ‪4000000000‬ then click ok. I have an issue sometimes when I record a gif, where the saved gif will have some of the greenscreen colors included. This is the greenscreen that is placed there by the application, not by the contents of the recorded frame. https://imgur.com/a/fiuXKyh This album shows what the gif should look like first, followed by what happens by default. If you download the first image, and open it using GifCam, you should see something like the second image happen if you then preview or try to save it with the default settings. Would you be able to fix this? Otherwise, this application has been really great, and I really love the compact design. Thank you for creating it. well, the latest GifCam version 5.5 can detect and set Greenscreen/transparent color automatically, but I see there is something wrong in your case, maybe because the gif contains a green color that is not 100% green and that’s confuse GifCam, I will check that in the next update, for now you can set the Greenscreen/transparent color manually , right click on any frame then greenscreen then chose yellow or other color that is not part of the gif. I’d like to know where I can download a program that is not infected. If you know about this site please inform me. All zip / rar files are open, and .exe files are checked through the Virus Total page and via my antivirus program ESET Smart Security Premium. On page Virus Total with program VBA32 was detected (1 / 69) BScope.Adware.Presenoker. Whether the program is infected or not. Thank you and have a nice day. Thank you for the feedback and I will try some other program on your recommendation. I’m sorry about GifCam. I just wanted him … the alternative is not the same. Thank you again. Thank you very much, this is how it needs to be done! You are awesome!